Today, just a few minutes ago from now Xiaomi VP Hugo Barra and India Head Manu Kumar Jain have unveiled the Redmi 2 Prime, which is more powerful variant of Redmi 2 and it comes for a just Rs. 1,000 extra than the Redmi 2, that is Rs. 6,999. Xiaomi has partnered with Foxconn to manufacture the Redmi 2 in Sri City in Andhra Pradesh and with that, Redmi 2 Prime becomes the first phone to be made in India. 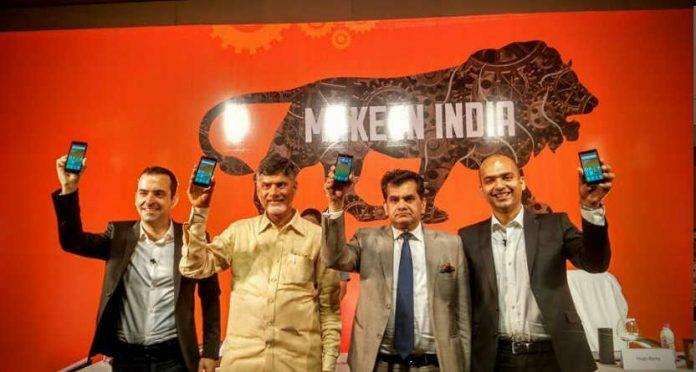 And the Andhra Pradesh CM Mr. Chandrababu Naidu was present at the event and he seems to be pretty happy that Xiaomi will manufacture phones in Andhra, and we can see this from his tweet. “Redmi 2 Prime is the first smartphone from Xiaomi to be assembled in our facility in Sri City. We would like to thank Andhra Pradesh government for helping us to start local manufacturing within just six months. Initial talks started in February and today we have already started to sell the Redmi 2 Prime,” said Xiaomi Global VP Hugo Barra. The Redmi 2 Prime was launched in China as a limited edition phone and later in Singapore as Redmi 2 Enhanced. So, basically the Redmi 2 Prime is just a bumped up variant of the Redmi 2. The main upgrade is in case of RAM and storage, where Redmi 2 features 1GB of RAM, and 8GB internal storage, the Redmi 2 Prime has got 2GB of RAM and 16GB internal storage. So, the storage and RAM got doubled in Redmi 2 Prime. other specs of the phone remain same as Redmi 2, so there is a 4.7-inch HD (1280×720 pixels) display with Asahi Dragontrail glass, and the phone is powered by a 1.2GHz Snapdragon 410 64-bit quad-core processor. Apart from the 16GB of storage on board, you can expand the storage upto 32GB via microSD card. The phone features an 8-megapixel rear camera with LED flash and a 2-megapixel front camera for selfies. The phone packs a 2,200mAh battery that the company claims is good enough for 14 hours of talktime. Connectivity options include dual-SIM card slots, 4G LTE support, Wi-Fi, and Bluetooth, and on the software front, it runs on MIUI 6 based on Android KitKat. So, below we have added the specs sheet which also shows a comparions between the Redmi 2 Prime and the older Redmi 2. However, there will be tough competitor s like Meizu M2 Note, which we will compare with the Redmi 2 Prime. Though if you wanna buy Redmi2 Prime now, you can just buy from Flipkart. If you buy Redmi 2, please buy from the links below as it helps us a lot.